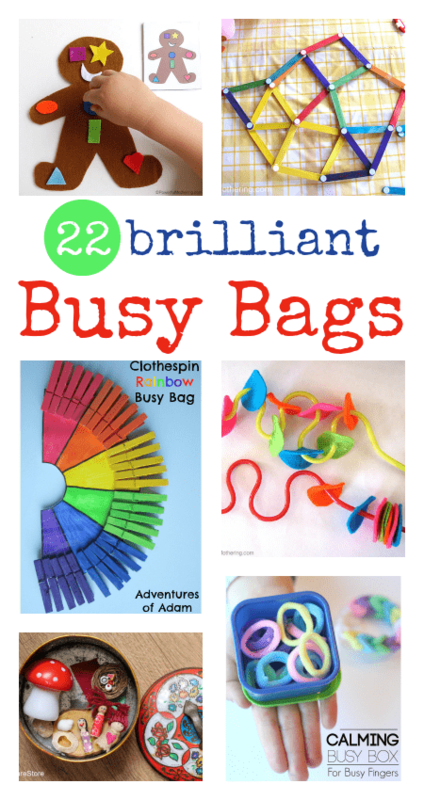 Here’s a brilliant collection of easy to make busy bag ideas for babies, toddlers, and preschool age children. Have you heard about busy bags? They’re a brilliant idea that you can use when you need a quick and easy play activity. If you put together a few of them, you’ll have a library of busy bags on hand for when you have a play emergency. So, when you need to make dinner, or keep a toddler busy while you change the baby’s nappy, or when you’re on a car journey, or it’s been raining all. day. long. you can pull out one of your busy bags and you have an instant activity. You can use busy bags for all sorts of fun play, for working on important milestones such as developing fine motor skills, and to start to learn about numbers and letters in fun ways.